Are Smaller Mobile Games More Successful? Striking a balance between the size of your bundle and the type and number of assets your game makes use of is an art form. Push as much as you can in right up front and force the user to wait a bit longer, or keep it small and download chunks later. There are a host of pros and cons for keeping your app under 100 MB that range from the on-boarding experience to retention and user-acquisition costs. If you’re developing a new game, getting any of these wrong could be detrimental to its short and long term success. Both Apple and Google have drawn a line at the 100 MB mark, but with different limits: iOS games aren’t limited in size, but games that exceed 100 MB can’t be downloaded over a cellular network, just wifi. Android games are limited to 100 MB and are forced to store additional assets in Expansion packs. Oddly enough, those get downloaded at the same time on most devices, so for this post we’ll be looking at the total size. In this post we’ll be looking at how successful developers went about structuring their games. 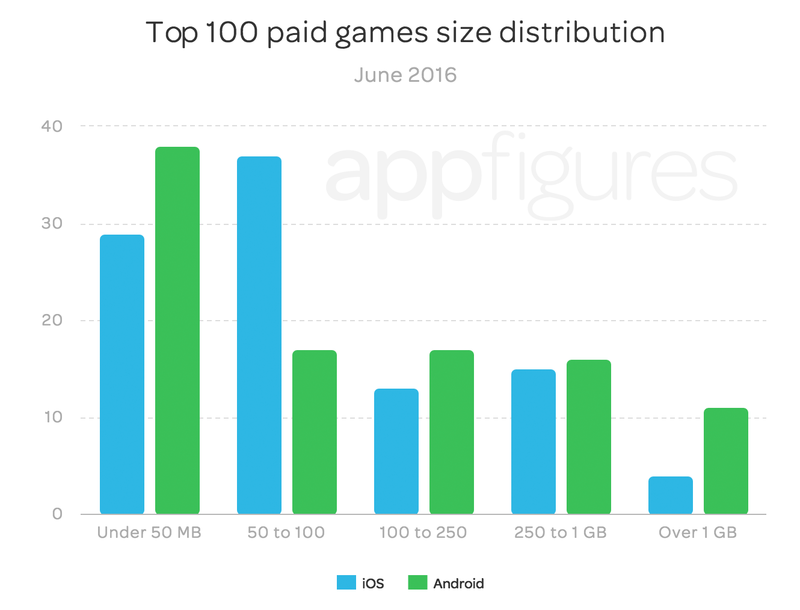 To get a better idea of what those games do we dug into our Explorer platform and pulled data for the Top 100 iOS and Android games in the US and analyzed their bundle sizes. Note: Any mention of Android in this post refers to games available through the Google Play store. Surprised? We weren’t either. Many genres of games have found ways to thrive with the freemium pricing model. Reduced user acquisition costs and less download friction are surefire ways to engage the mass audience. 19% of the Top 100 iOS games are over 100 MB. Those that are over the limit seem to remain under 250 MB in general with only one extreme offender, Gameloft’s Asphalt 8: Airborne that’s a hefty 1.2gb. Android is very similar, but because of the initial 100 MB limit, a bit more extreme. 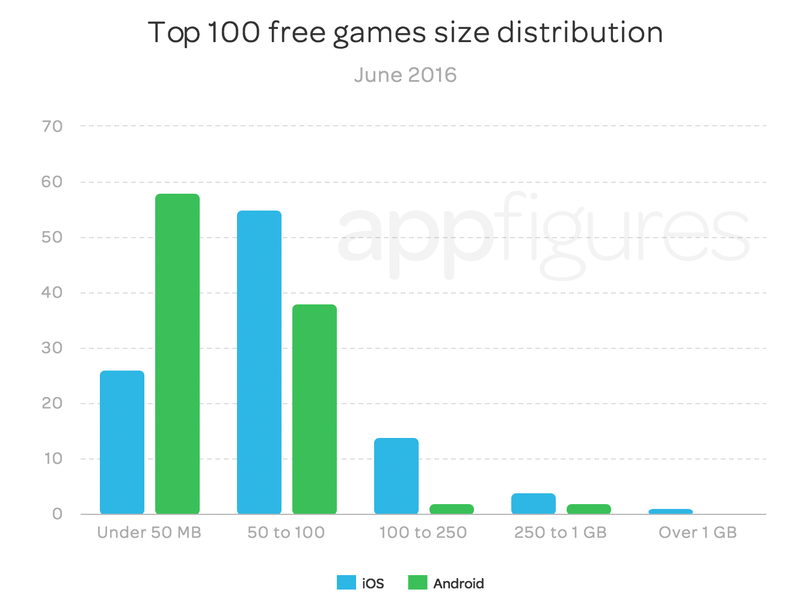 Only 4% of the Top 100 free Android games are over 100 MB. That means most free games aren’t making use of expansion packs at all. In fact, the average file size of an Android game is considerably lower; at roughly 58 MB, free Android games are about half the size of free iOS games, which average 105 MB. It’s also worth noting that if we zoom in on the top 25 games, there’s only one Android game that exceeds the size limit and four iOS games. Paid games seem to exist in completely different universe as you can see in the distribution above. Strangely enough, Android beats iOS in bloat. 44% of the top paid Android games are over 100 MB. That means that unlike free apps, paid Android games are making heavy use of expansion packs. iOS games aren’t too far behind either. More than 33% of the top paid iOS games are over the limit. The average paid iOS game comes in at roughly 210 MB, double than free iOS games. Those numbers are even higher for paid Android games, which average 330 MB, almost five times larger than free Android games. We found it interesting that between the two stores there are 15 paid games that are over 1gb. Four iOS and 11 Android games. That’s quite a few bytes. All of those seem to be games with well known IP, which probably means they’ve got a dedicated fan base that’s willing to wait. That addicted user base seems to be mainly on Android as well, which isn’t where we thought they’d be. But the numbers tell a different story. There you have it. ~98% of the top 100 free and ~62% of paid iOS and Android games can be downloaded without wifi. Architect your games wisely with your audience in mind, and don’t forget to eat your vegetables. Tweet @appfigures if you want the source files for this analysis, are curious about other countries, or just want to say hello. Interesting analysis you got here. Does it include the additional data packs that users have to download after installing the app on the device? Oh, and also, where is the chart for top 100 paid games? I only see the top 100 free games in the above analysis.. The analysis is taking into the account all additional bundles, as long as they’re proper expansion packs. Data that is downloaded ad-hoc at a later time isn’t included. Well, our take from this is that games that are under 100MB have a better chance at success. This is of course, only based on chart performance. We touched on games that are over 100MB towards the end. The gist is that apps that are large in size seem to only work for large and very well-known brands like Batman or NBA. You see this more with paid apps, but there are a few instances of free apps as well.